It’s a big day in the Bender Household! It’s our first full day home with our newborn son, Maverick. <3 We are madly in love with our new baby boy, and he has the sweetest little personality already. I think he already looks just like his daddy. We got home from the hospital yesterday afternoon, and have been settling in. 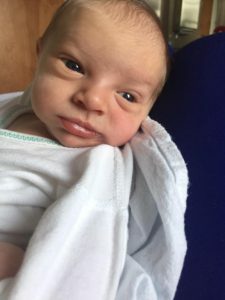 I got the most sleep I have since before I went into labor, and I feel so much more rested. Maverick Lance Bender. <3 Born on the 4th of July. 7 lbs, 9 oz. and 21 Inches Long at 7:02 PM. Maverick gets a very special honor, of not only sharing his birthday with Independence Day (the name Maverick means Independent/Non-Comformist), but also with our eldest nephew, Hayden. I think that is going to make an extra special bond between the cousins, despite the 10-year age difference. Okay, before I go off posting the 10-million photos I have already taken of my little boy, let’s shift into workout mode. 🙂 Today’s workout is a 15-Minute HIIT Interval Fat Blaster. This routine combines cardiovascular exercises to maximize your fat burn, along with body shaping/sculpting exercises to isolate and challenge your muscles. Go for max reps, and push to get in an extra one for me. The countdown is on until I am able to start filming brand new workouts for you all again! I can’t wait! My body certainly feels different after having a baby, and I am excited to build strength again. Being a mom puts my desire to be healthy on a brand new level. It’s my responsibility to take care of this little person I brought into the world, and also to model healthy habits to help him be as healthy as possible. Okay, just one more photo. Awe!!! Congratulations on your new baby boy!! He is just perfect!! Thank you for continuing to post videos. I have been doing your workouts for over after and love them!! Thank You and Many Blessings!! Melissa, your baby is so beautiful!!!! Normally very small babies are kind of red and full of wrinkles, but your son looks great!! Looks like all your exercising made a lot of good to him too 😀 Very happy for both of you, you and your husband! Thank you for being so motivating, you’re fantastic! Congrats! Motherhood is a very big adventure and yes, your body is a totally different animal now than it was before, but it’s all worth it. It will be interesting to me (a mom of 2 boys) to watch this unfold for you and to see how you work out these new challenges. I’m quite sure you’ll bounce back quickly and even in your struggles continue to be an inspiration to all of us who follow you. So precious! I have one son and another son due in November. I have enjoyed following your videos before heading to work when time permits. After such a wonderful pregnancy, we’d love to hear your birth story if you’re willing. Thank you for sharing your journey! So very happy for you both, Melissa – he is absolutely perfect. Enjoy all the snuggles; my newest is 7 weeks now and the time just FLEW by! I hope your recovery has been easy! Congratulations on your little one! I can’t believe it will be one week tomorrow, so I already know what you mean about time flying. I just want to savor each moment. So very happy for you and Jessie! He is beautiful and looks so healthy just like his parents! Congratulations! He looks almost like he is smiling in that last photo, must be a content little man already, he is just beautiful. 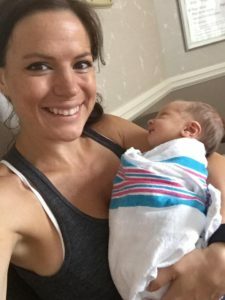 How are you finding the post partum changes with your body? Everything feels alittle out of place and strange for a wee while, although I’m sure you will bounce back faster than most from all the exercise you managed to keep up right until the final days. He really is beautiful. A perfect birth weight. I hope you managed through it all ok. You look great Melissa so I’m sure you did. Thank you for your post today. Know that we all understand if you miss a day or three, or more. Congratulations!! You and your husband are blessed! Enjoy that sweet baby! He’s gorgeous! You surprised me with posting a new workout already. I’m thankful for you, but I know I will be fine if you just take time away to be a new mom and soak up new baby love. It’s amazing. I’ve done it 3 times and love the experience!! congratulation. He is just precious. I have an 4th of July baby as well. She is definitely my little firework!!. Praying for your recovery and sweet time bonding with him. Children are a blessing!! <3 I hope your daughter had a great birthday! Congrats to Maverick and your family. Life is good. My 4 kids are just melting over the pictures of your delicious little new baby boy before they watch me work out! Congratulations!